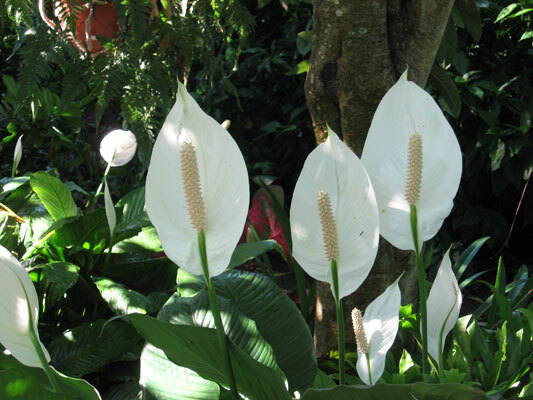 Maybe you call these plants Peace lilies most likely due to the white flag-like flower portions properly called a spathe. These white modified leaves surround the true flowers and are probably why the plants have both the scientific and common names spathiphyllum. Well, they are on parade in my landscape flowering freely. In the landscape is where they stay most of the year growing in containers. Some over the years have been willing to take a chance and grow them in the ground. But where I live it can get cold and the plants are often damaged by temperatures of freezing and below. This year the plants are spectacular. Most likely it is due to the mild winter where there was minimal plant damage as many did get left outdoors during the cold. If it gets really cold, some are protected in a small green house but others have to fend for themselves under covers in the warmest spots of the landscape. 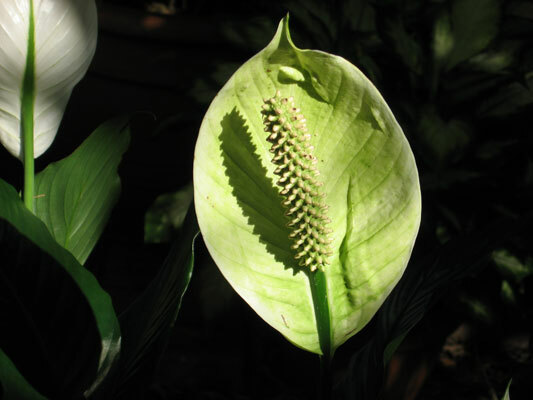 Late winter and spring are the normal flowering times for spathiphyllum as they are affected by day length. This is when you can see the most blooms but they do flowers sporadically throughout the year too. The plants fill with the white spathes for weeks of shade brightening blooms. My plants grow in heavy to light shade. They burn in full sun and turn very yellow. When flowering is over it is division time. Most fill their containers very quickly during the warmer months. Don’t feel bad about taking a knife to cutting the plants in halves or in quarters and giving each a new container. Then I add a slow release fertilizer like Osmocote or Miracle-Gro Shake’n Feed to supply nutrients for 3 to 4 months at which time they get another feeding. Do keep the soil moist as spathiphyllum like a damp soil. One concern I get mail about is the white spathes turning green over time. You have to remember these are modified leaf portions and many eventually develop chlorophyll and turn green. You can enjoy them or just cut them off. By the way, this is a great house plant too. It grows in the lower light areas but needs bright light to flower.